One subset of games I am hopelessly devoted to are the Mario RPGs. There’s the original Super Mario RPG, of course, but my fondness is mainly for the Mario & Luigi and Paper Mario games. Both series tend to be fairly consistent, quality-wise, making it hard to pick out a single favorite. I have fave characters across them all (Goombario, Vivian, Fawful, etc. ), plus the level designs, writing, graphics, and music are all great. Even the most un-RPG-like of the crop, the Wii title Super Paper Mario, is a fun and engaging game, with much to recommend it. Unfortunately, this streak has now been broken, as I have just finished playing a Mario RPG that would definitely not be in the running for my favorite—not even close. 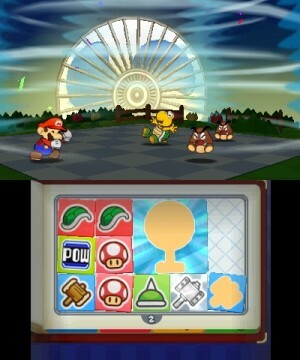 In fact, this game, Paper Mario: Sticker Star, is unequivocally the worst Mario RPG I’ve played to date. 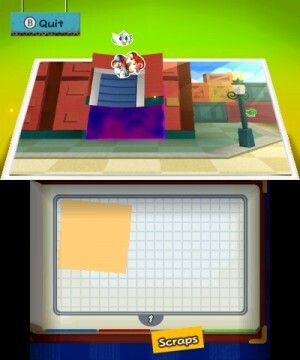 Sticker Star by itself is unusual: it’s a 3DS game; in other words, the first and only portable entry in the Paper Mario series. I’m not sure why it wasn’t made for the Wii U instead, as that would seem to be a more fitting home for it, though maybe it has something to do with the fact that it looks great with the 3D effect cranked up. As for the game’s structure, it goes back to the turn-based battle styles of the first two Paper Marios, but this time, there’s no additional party members. Mario is accompanied by a helper character, though: a silver crown sticker named Kersti. She is introduced shortly after the opening, where, during a festival in which a magical sticker comet receives the wishes that the Mushroom Kingdom makes on it, Bowser disrupts the activities, causes the comet to break up and disperse, and, of course, kidnaps Princess Peach. Kersti, a steward of sorts for the now-scattered Royal Stickers contained within the comet, appears before Mario and immediately blames him for the chaos. When he sets her straight, she doesn’t believe him, but changes her tune after he offers to help her find the Royal Stickers. From the very beginning, she is an ingratiating, pushy, judgmental presence in the game, and, aside from her many neutral moments, is more annoying than any other friendly character from previous Mario RPGs. So, right away, we have Mario and the self-appointed Nagging Sticker Mom going off on their quest. After dealing with their town’s destruction, the Toads are startlingly nonplussed about their Princess being kidnapped; she is pretty much never mentioned by any of them until near the end of the game. As for the rest of the game’s characters, Peach is mostly just a goal to reach, Luigi is reduced to a background element (literally), Yoshi appears only as a sphinx, and Bowser doesn’t even speak. Recurring flunky Kamek plays a role, as do Bowser Jr., a Wiggler, a Snifit, and a few of the Toads, but that’s about it for the cast. It’s as bare-bones an ensemble as there has ever been in these games. The quest itself starts off well enough. The battle system is basically the same as in the other games, with the core attacks involving jumping or hammering, and bonus damage for getting the timing right. However, the twist this time is that all of Mario’s moves—attacking, healing, whatever—can only be pulled off by using a corresponding sticker. There are limits to the number of stickers that can be carried at any given time (these inventory limits are expanded during certain special events, such as when a Royal Sticker is collected), and some special stickers are bigger than others, which means that space management is a huge factor in getting through the game. Aside from your typical stickers which can be picked up at stores or on the field, there are also special ones made from “Things”, which are non-paper, three-dimensional objects that appear throughout the land. Once turned into stickers, these Things can carry out elaborate super moves, much like summon creatures in other JRPGs (my personal favorite is the Soda). Of course, there are limitations when it comes to these Thing Stickers—for starters, they don’t have in-menu descriptions like regular stickers—but this isn’t a problem most of the time. However, some of the puzzles and other situations that require stickers can be surprisingly tough to figure out. This is especially true of the boss battles, where it is far too easy to lose because you used up all your stickers and the enemy is still alive. Conditional battles, such as many of those against bosses, are nothing new in JRPGs, but when one is completely reliant on items and inventory limits to fight them, that’s when problems arise. Sometimes, if you’re lucky and pace your attacks right, Kersti will appear and maybe even drop a hint. One of the most convoluted puzzles in the game involves a giant Chain Chomp. It’s obvious that the goal is to guide the Chomp to a specific place, but every time Mario gets within range of it, a battle is triggered. Keep in mind that all Chain Chomps are invincible in Sticker Star, and thus, attack items are, for the most part, useless. The solution to this problem is a lengthy six-step process which I had amazingly somehow figured out myself over the course of much trial and error, though it was less of an “Ah-hah!” moment and more of a “Finally” one. Given how the whole scene is set up, it shouldn’t have been hard to craft a simpler puzzle that gave the same results, but instead, one has to execute a clunky solution for which only the barest hints had been given in advance. Aside from the sticker puzzles and boss battles, the levels are standard Paper Mario fare at their best—which is the majority of the time—and minor annoyances at their worst. The puzzles which require not stickers but “scraps” of the papery world tend to be both more sensible and interesting, and there’s the usual plethora of hidden areas and treasures to discover. Some levels are more entertaining than others, and most all of them encourage repeat visits. The levels are largely plot-free, but, unfortunately, the two areas that are story-heavy feature the most tedious bits of exploration in the game. As for the more aesthetic frills, the writing (what little there is this time around) and localization is as witty as always, the music is pleasing and catchy, and the graphics look wonderful. Mario RPGs have always excelled in these categories, so these are just things to be expected. Given my history with the previous Mario RPGs, I really wanted to love this one, but in the end, I just couldn’t. If this was another franchise, and another set of characters, Sticker Star may be seen as a great game with a few niggling issues, but this is Paper Mario, dammit, and as such, I expect a first-class experience. Part of me wonders if the reason that this installment is sub-par might be because Intelligent Systems wanted to devote more resources to Fire Emblem: Awakening and made Sticker Star less of a priority, but this is mere speculation on my part. As it stands, I know this developer can do better with this franchise, as it has in the past. Anyway, if you’re a fellow Mario RPG devotee, you might want to check this out, but keep in mind that it’s not as good as the previous games. For everyone else, I can safely say this is nonessential.